Kayaking and paddle-boarding are two of the events Miami Trace students experienced during FFA Camp. On July 5, students from Miami Trace High School in cooperation with Great Oaks FFA chapter attended FFA camp Muskingum. Students who attended FFA Camp included Meri Grace Carson, Graham Carson, Makayla Eggleton, Morgan Eggleton, Bryce Bennett, Garrett Hagler, Regan Hagler, Rebecca Heckathorn, Nathan Malloy, Blake Bradshaw, Quinton Waits, Blake Roberts, Tyler Cummings, Seth Simonson, Preston Huff, and Kyler Adkins. During camp week, FFA students got to spend time with Ohio’s FFA state officers as well as meeting students from other chapters across Ohio. The week was full of exciting events and fun activities, such as motor boating, kayaking and paddleboarding, participating in workshops put on by the state officers, and meeting many new people. FFA Camp is a unique experience for all members who are able to attend. 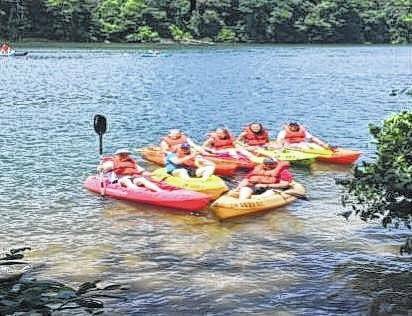 https://www.recordherald.com/wp-content/uploads/sites/27/2017/07/web1_FFACamp.jpgKayaking and paddle-boarding are two of the events Miami Trace students experienced during FFA Camp.